On Friday the 19th August the Luing Cattle Society held their 50th Anniversary Open Day back on the Island of Luing where it all started - courtesy of Shane and Tooti Cadzow. Despite the west coast drizzle, an impressive 550 people attended. Having travelled from as far afield as Dartmoor to Orkney and North and South Ireland this was no mean feat! 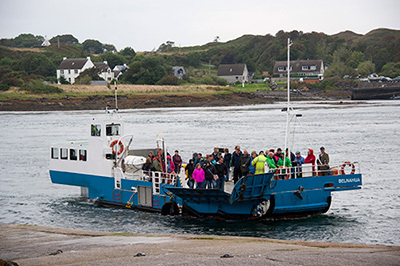 The Cuan Sound was a busier than ever with the strait’s shuttle ferry running full speed all afternoon while accommodating the island’s visitors. 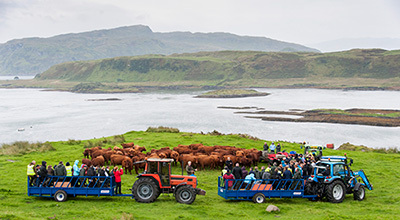 Tractor and trailers awaiting, visitors climbed on board to embark on their tour around the island, stopping off at five points to see and hear about the cattle and the various systems carried out within each specific environment. Chairman Ted Fox welcomed everyone to this historic event and introduced Shane Cadzow our host who was delighted to have John Cameron C.B.E, Balbuthie, Fife perform the opening ceremony. John went on to give a fascinating speech on the breed with lots of facts and nostalgic moments recalling many fond memories. Those newer to the breed found the educational aspects of his talk additionally fascinating. Finlay McGowan (Former Fieldsman), Incheoch Farms, Alyth then recollected his notable time with the Society, the breed and Cadzow family. One of the special features of this memorable Luing Anniversary event was of course the keenly anticipated Prize Draw for a cracking Luing heifer. It was organised by the Society, not only to commemorate the 50th anniversary but also importantly to raise money for MND (Motor Neuron Disease) Scotland. Shane Cadzow’s sister Juliet introduced Iain Mc Whirter from MND Scotland who explained this cruel disease to all who attended, stressing how very important fund raising was to assist in the search for a cure. Juliet who sadly lost her husband David MacLennan two years ago to MND, then read a poem David had written for the 40th Anniversary. Organisers were delighted therefore to announce that £10,000 had been raised during the run up to the big day. Tooti Cadzow drew this major raffle and the winning ticket went to Andrew Lyth, Sheephouse, Higher Greens, Stacksteads, Backup. Andrew who also has personal experience of MND having lost his mother-in-law to the illness, kindly asked that the heifer be auctioned to help raise the final total and the heifer was auctioned at £2,100, selling to Neil McGowan, Inchoech, Blairgowrie. A huge thank you to everyone that purchased a ticket and helped this charity.